Only a week passed since the Education Reform bill was enacted. And already prominent columnists of Turkeyare being inundated by readers’ complaints that the elective Kuran and other religion courses are not voluntary at all. Prior to the passage of the bill CHP convened its administrative board meeting in the central Tandoğan Square in Ankara, as symbolic gesture to protest the Education Reform. According to newspaper reports, up to 50K attended the meeting. CHP said it will organize whistle-stop tours across the country to take its position to the public. Thousands of Turkish opposition supporters demonstrated in the capital Ankara yesterday against a government attempt to railroad a new education bill through parliament which secular parties say is designed to promote Islamic schooling. The government wants to overturn a 1997 law imposed with the backing of the military which extended compulsory education from five to eight years, but also stopped under-15s attending religious “imam hatip” schools. Prime Minister Recep Tayyip Erdogan and nearly half his cabinet attended imam hatip schools. The main secular opposition People’s Republican Party (CHP) agrees on the need for education reform, but says Erdogan is seeking revenge for the 1997 law and attempting to bring about his stated desire to raise a “religious youth”. A 2010 World Bank study showed only 16% of 15-year-olds in Turkey attend schools with average reading, maths or science test scores comparable to or above an OECD (Organisation for Economic Co-operation and Development) average. Relying on its large parliamentary majority, Erdogan’s AK party is to introduce the education bill to the assembly and plans to complete voting on it by Friday, or if that is not possible keep parliament open over the weekend until it is passed. In response, the CHP decided to hold its weekly meeting of parliamentary deputies in an Ankara public square, the first time this has happened in the history of the republic since it was formed in 1923. The AK Party called it unconstitutional. “The people and the CHP are claiming their rights in this national struggle,” CHP deputy leader Erdogan Toprak told reporters at the square, accusing the AK Party’ of bulldozing the bill through the committee stage where it packed the room so that no one from the opposition could get in. Faced with government efforts to rush it through parliament, Toprak said the CHP would do its best to hold up the bill, calling it “dynamite planted under the Turkish youth”. While the AK Party has won three elections since 2002 and remains popular, there is a large minority of urbanised Turks who are wary of its roots in political Islam and suspect it has plans to overturn, piece-by-piece, the secular republic. At least 5,000 people filled Ankara’s Tandogan Square, waving Turkish flags and carrying placards against the “4+4+4” education bill, so-called because it extends compulsory education to 12 years – four years primary, four years middle school, followed by four years of secondary school or vocational training. Imam hatip schools would count as vocational training, allowing a boost to the numbers attending. “4+4+4+Erdogan = 0” ,read one of the banners. After comments from the head ofTurkey’s top court that the judiciary will not be subservient to the government, ruling party officials and opposition representatives voiced their opinions on the debate on Tuesday. Devlet Bahçeli, head of the opposition Nationalist Movement Party (MHP), told journalists that Kılıç had an important warning. 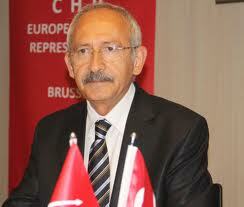 Opposition Republican People’s Party (CHP) leader Kemal Kılıçdaroğlu also voiced a similar opinion on Kılıç’s remarks. Although late, he said, the remarks were good. Kılıç, who spoke at the opening of the International Symposium on Judicial Reform, stressed that the Turkish judiciary faces important problems and that they will not allow the judiciary to be encircled by politicians. “Yesterday we opposed the judiciary’s efforts to encircle politics and today we oppose politicians’ encirclement of the judiciary,” he said.